SALISBURY’s Studio Theatre has scored a double triumph, winning two of the region’s drama festivals with a production of A Flock of Tigers, which you can see at The Woolstore in Codford on 12th May, and again in Salisbury on a June date to be announced. 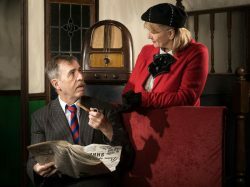 The Salisbury group won at the Woolstore Drama Festival, and at Totton Festival of Drama at Hanger Farm Arts Centre with the one-act play, taken from the radio series Double Acts, by John Finnemore. At the Woolstore, the Studio Theatre team were defending the title they won two years ago, against companies from Trowbridge, Mere and Warminster. As well as the winner’s trophy, Lesley Bates picked up the adjudicator’s shield for Best Director and Rachel Fletcher was named Best Supporting Actress. 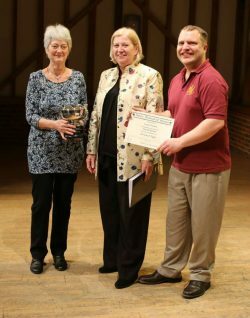 There was a justifiable sense of pride for the Salisbury group winning at the week-long Totton festival, at the end of March, which attracted 15 entries from groups as far afield as Newbury, Portsmouth, Southampton and Farnborough. A Flock of Tigers will be performed by Studio again at the Woolstore Theatre at Codford on 12th May and at Studio Theatre in Salisbury on a date to be announced in June. Pictured: Paul Chalmers and Rachel Fletcher in A Flock of Tigers;, Trinity Photography; director Lesley Bates with adjudicator Jennifer Scott-Reid and the Totton Festival chairman Mike Farleigh. Posted in Prompt on 6 April, 2019 .